2018 DLL UPDATE! In this article, you will find our compiled 1st Quarter Grade 1 Daily Lesson Log (2018 DLL). We at DepEd Teachers Club aim to complete all the Grade 1 Daily Lesson Log (DLL) to make them available to our fellow teachers and help them complete their resources to make their efforts more directed into the actual teaching process. 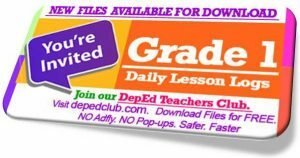 You will find the 1st Quarter Grade 1 Daily Lesson Log (2018 DLL) download links at the bottom of this article. If you have time, please read the article below for some background about the K-12 curriculum from the Department of Education. What should be taught in the K-12 Curriculum according to the Department of Education? Teachers must have a deep understanding of the curriculum and strive to teach its content. In planning daily lessons, teachers need to follow the Curriculum Guide (CG) of the learning area being taught. Using the Curriculum Guide (CG), teachers can plan the many ways to teach what it contains including the content standards or the essential knowledge that students need to learn, performance standards or the abilities and skills learners need to demonstrate in relation to the knowledge they have learned, and learning competencies or the knowledge, skills, and attitudes learners need to demonstrate in every lesson. Following the CG, teachers can also plan their instruction backwards. That is, they can set a long-term vision of what learners need to be able to master in terms of content and competencies at the end of the school-year and endeavor to achieve this goal. At the end of the year, learners should have mastery of grade level standards and demonstrate readiness to learn the curriculum standards of the next grade level. Teachers can guarantee this by taking advantage of and maximizing the coded curriculum. The lessons teachers plan daily should aid learners in mastering the content and competencies of the curriculum progressively. Each lesson plan should, therefore, have learner-centered objectives that are aligned with the standards of the curriculum. In preparing daily lessons, teachers can also make use of multiple resources that are available to them including the Teacher’s Guide (TG), Learner’s Material (LM), additional materials from the Learning Resources Management and Development System (LRMDS) portal, textbooks, and others supplementary materials, whether digital, multimedia, or online, including those that are teacher-made. However, these materials should be used by teachers as resources, not as the curriculum. We at DepEd Teachers Club are always on the process of uploading 1st Quarter Grade 1 Daily Lesson Log (2018 DLL). As requested, here are the file links. The remaining files will be uploaded soon. Please check this section from time to time.